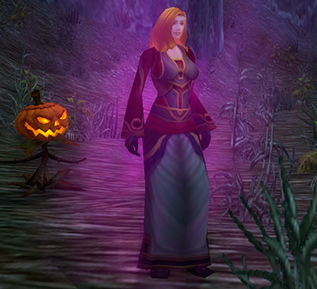 Lydia Accoste is located in Deadwind Pass, by Karazhan at 40, 76. Just have a mage port you to Stonard, then mount up and fly due west of the camp. Her pets are Boshibosh, Jack and Nightstalker. If you dont play your cards right, you might end up in the hospital, but dont worry, We got the medicine! Jack - This pumpkin is an elemental, hes not to tough, just rememebr that elementals ignore weather effects, so you want dirext attacks here. 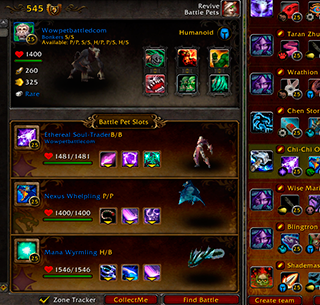 Round one: Start with your leveling pet, let the round resolve then swap into the Harbinger of Flame. Immolate, then conflag. clean up with burn spam. Bishibosh is undead, and he likes to copy your spells. So give him an immolate, it wont hurt very much and it sets him up for the conflagerate combo. here you just want to spam burn untill conflag comes back up. Nightstalker is also undead. She will set death and decay down, its not going to tick for very much so just keep your cycle going. start with immolate, then conflagerate, follow up with burn spam rapeage, Ding Dong, the Witch is dead!